What do weary cruisers do after a long day of sightseeing…they eat, of course, just like everyone else! Only this was an extra special occasion. 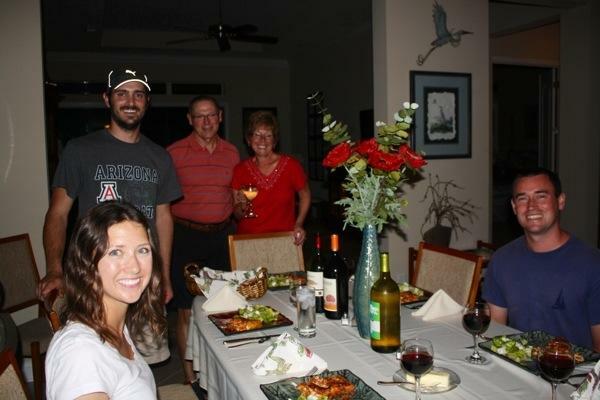 Tonight we would dine with Bob and Susan at their home. We warned them, though, once you start befriending cruisers you never know who might walk through the door! The evening was most memorable, Bob and Susan really made us all feel right at home. For Matt and Jessica this was their first time in an actual house in five months! We lounged on spacious couches and were able to set down our drinks without fear of them sliding away. We caught up on the latest television commercials between NFL Playoffs. Susan had really outdone herself preparing a scrumptious lasagna. She even shared Wayne County wild blueberries in a dessert that was, well, it was just too tasty to articulate. Thanks again to Bob and Susan for a fabulous visit! Don’t worry, we’ll keep this exclusive cruising station on the down low…Road Trippers and VIP’s only!